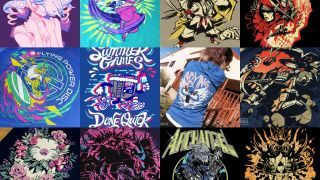 The world of gaming merch wouldn't be the same without Nina Matsumoto, and she tells us how she does it. If you have some video game shirts in your wardrobe, there's a good chance at least one of them is hers. If you go to a gaming convention and see crowds adorned from the waist up in the characters and iconography of their favorite franchises, her presence is almost unavoidable. Her name is Nina Matsumoto, she's from Canada, and since 2011 she's become one of the most prolific video game T-shirt designers in the business. What'll you wear your love for next? Look through our list of the best upcoming games of 2019 and find what your next merch-worthy hobby will be. Between official collabs and tributes, Matsumoto puts a conservative tally of her total video game shirt design count at around 130 (not counting pins and other merch). For reference, that would be enough to wear a new T-shirt every day for more than four months. If you did all your laundry at once, even after watching one of those lifehack videos that shows you how to fold a T-shirt in 3 seconds, it would take you six and a half minutes to get them in a neat folded pile. Also, as a totally justified aside, those lifehacks never account for how long it takes to lay each T-shirt out nice and flat first, which is total BS. "It’s cool going to a con and seeing my artwork everywhere, and very rewarding," Matsumoto tells me over email. She's too busy making sweet gaming merch to do a call, which I respect; she's a full-time designer at a game merchandise company with a big presence online as well as at shows like PAX and MAGFest. You'll spot her art on the shelves, on the employees, and on the dozens of bodies in the line stretching around the booth. These days it may be in the form of one of her newer creations like a set of Deltarune enamel pins, or this ode to Dark Souls' Gwyndolin, or perhaps some vintage-poster inspired Guacamelee threads. "Back when I was first getting started, it was rare enough that I would tell people (if they were standing nearby or whatever) that they’re wearing my design and would thank them for getting it. However, it quickly became impossible to thank them all," admits Matsumoto. Her first gaming-related design and second shirt (the first was for an anime convention) was this mash-up of Ouendan, the Japanese counterpart to Elite Beat Agents for Nintendo DS, and a now-defunct magazine. Matsumoto started picking up more work with online apparel companies like The Yetee to do tributes, remixes, and parodies of games: one enduring example is this evocative Super Metroid design she did for Games Done Quick. It was a medium she had a good deal of experience with, from earlier in her career as an artist to her first projects at Fangamer in 2013. As the company grew, so did its stature and relationships within the games industry. Now it's an official merchandise creator and distributor for games ranging from Shovel Knight to Dark Souls to Persona 5. "Indie games tend to agree to more stylistic interpretations of their characters, whereas big studios can be stricter about how their characters are depicted"
Matsumoto was pleased to start working on more official collaborations. That way she knows the people who made the game are happy with her work, she says, and fans can support both them and her by purchasing it. A design called "Monster Mosh" that she did for Crypt of the Necrodancer back in 2015 is still her favorite. "It's my first Fangamer shirt that was my idea from start to finish, completely my style, and required no edits. It's a popular design, and many devs have referenced it when talking to us about what kind of shirt they want. It’s also for an amazing game made by a great studio based in my hometown of Vancouver." The end product is well known, but I've always wondered how an official video game T-shirt actually takes shape. Is there a bidding process between the production firm and the designers? Is there a boardroom meeting with lots of sketches and proposals? Are there terse discussions about brand values? "Sometimes the IP holder has an idea of what they want, but the majority of the time, they leave it up to us," Matsumoto says. "It's nice to have that creative freedom. They more often than not are completely on board with what we come up with. Then they just give us the okay to go into production. Indie games tend to agree to more stylistic interpretations of their characters, whereas big studios can be stricter about how their characters are depicted. Approvals can take longer with bigger studios too – waiting is the hardest part." Concepts, illustrations, design notes, production schedules. All for 130 shirts across 8 years. Is she getting tired of it? I didn't get that impression. Sure, Matsumoto recently branched out with her own shop, full of original art prints (it's all fulfilled by Fangamer out of Tucson, Arizona), and last year she drew a Scholastic children's book about two cats in a robo-dog suit called "Sparks". Even with all that to keep her busy and branching out, there's still something special about walking out onto a show floor, into a living sea of her own artwork. "I draw comic books on the side, but I can’t tell if anyone’s familiar with my work just from looking at a crowd," Matsumoto says. "With T-shirts it’s immediately visible, and when I go to a convention I can see how widely spread my work is. I appreciate each and every person who wears my shirts – but I do it silently in my head now instead of bothering the shirt owner."